some september project libraries highlight materials that relate to issues that matter like peace. some september project libraries work with various civic institutions to provide civic education. 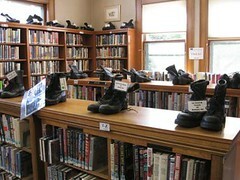 and some libraries, like aberdeen timberland library, do both. We first collected what we had locally [books, videos, dvds, children’s books in English and Spanish, etc.] on the broad and important subject of PEACE. We were later contacted by the local community hospital, who asked us to be in touch with the County Emergency Preparedness Agency because September was Emergency Preparedness Month. They are providing handouts which they would like us to distribute; and they want us to support their display with our books. Cooperating with the hospital and the county for Emergency Preparedness sounded like a very good idea to us. Our librarian then took the idea to the City Council meeting and the Aberdeen City Fire Chief has provided us with information to distribute as well. This display is now a collaborative effort among the Aberdeen Timberland Library, the Grays Harbor Community Hospital, the county of Grays Harbor Emergency Management Department, and the city of Aberdeen. We are very pleased to join with these agencies in promoting emergency preparedness. We felt that both these displays would be appropriate for The September Project. They will be on display beginning next week.